The 9 Best Breakfast Places in West Virginia! It's said that breakfast is the most important meal of the day because it gives your body the fuel it needs to function after sleep. In our culture of busyness, it's nice to sit down with family and friends and just enjoy the morning with a great cup of coffee and a plate of delicious home-cooked goodness. Here are 10 breakfast places in West Virginia that specialize in serving great breakfast food. Referred to as a breakfast and lunch eatery, the Flying Pigs Café in Thomas, West Virginia, is open daily until 2 p.m. The comfortable homey feel inside will make a nice backdrop for an early breakfast in one of the most beautiful areas of the state. Besides the traditional eggs and pancakes, they have in-house specialties like a Mexican-style biscuits and eggs dish. The prices are reasonable and the food is filling. Bright Morning Inn in Davis, West Virginia, is a full-service bed & breakfast that's open to overnight guests and the public five days a week for breakfast only. Nestled in the Monongahela National Forest, the inn's restaurant offers yummy dishes like peach pancakes with locally-produced honey and maple syrup, or a big favorite, Banana Dream French Toast. If you're a traditionalist, they do have classic biscuits and gravy and oatmeal with brown sugar and milk. “Come a stranger, leave a friend,” is the motto of this quaint little diner located in Romney, West Virginia. Appropriately named the Romney Diner, this surprising little place offers free Wi-Fi. Originally known as a local creamery in the late 1900s, it's also been a saddle and tack shop and a taxi stand used by locals. Opened as a diner in 2006, breakfast is served all day and if you're in a hurry, you can order your food to go, although the home atmosphere is definitely appealing. Great food, friendly service, and free Wi-Fi make this out-of-the-way eatery a welcome for hungry diners. Hilltop Diner in Cowen, West Virginia, is located near the Tea Creek Trail, part of the Monongahela National Forest and feels like home with the simple, but satisfying menu. No frills here, just plain good food. Open for more than just breakfast, the Cornerstone Café in Glenville, West Virginia, is a hidden gem. You'll feel like one of the family by the friendly servers and you can't go wrong with anything you order off the menu. The biscuits and sausage gravy is a popular favorite in this family-owned and operated spot. Highly recommended. If you're looking for a healthy alternative to traditionally heavy breakfast food, First Watch in Charleston, West Virginia, is a great place to try. 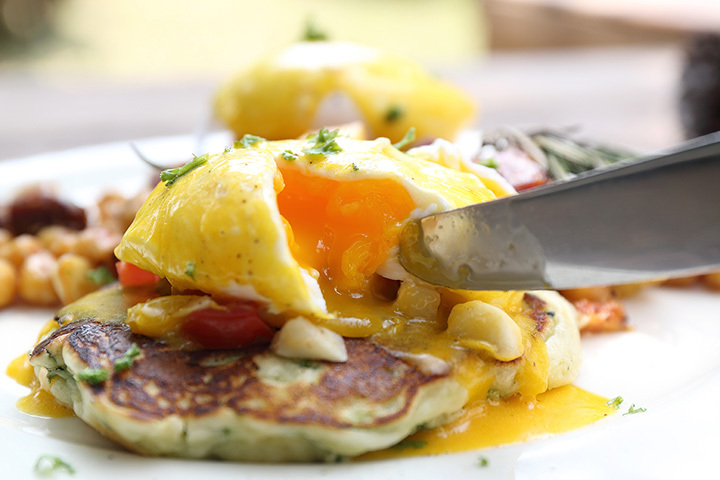 Recommended by hotels in the area, this eatery is open for breakfast and lunch, and visitors can find great choices like omelets made with fresh spinach, onion, and feta cheese, muesli pancakes, or something from their fresh juice bar. They only use the best ingredients and that's reflected in the taste of their food. If you've ever wanted to take a trip to Italy, but didn't have the time or money, Tutto Gelato Café in Morgantown, West Virginia, is the next best thing. Diners can enjoy a welcoming atmosphere that features Italian wall photography, a great coffee and gelato bar, and a full-service menu that includes breakfast. Breakfast choices combine Old World flavors with a New World twist. Try the Arezzo Panini made with egg, sausage, tomato, arugula, and fontina cheese. If you can't decide between traditional eggs and bacon or sausage breakfast or oatmeal with fresh fruit and a bakery item, you can have it all if you visit Regatta Bar & Grille in Morgantown, West Virginia. This all-you-can-eat breakfast buffet gives you the opportunity to build a balanced meal and be healthy at the same time. You can also try new things by test-tasting foods that you might not want to order off a regular menu. For those who like sleeping in and combining breakfast and lunch later in the day, The Main Dining Room in White Sulphur Springs, West Virginia, has the answer to your dilemma. Beautifully displayed, the buffet showcases the ripest fruits and vegetables, freshly squeezed juices, and bottomless cups of coffee. You won't find anything ordinary here, and they have an omelet station where everything is made to order. You wouldn't expect anything but elegance at this fine dining room, located inside the historic Greenbrier Resort.